A new roof is a significant investment. Done right, a brand new roof will increase your home’s value and give you peace of mind. Done wrong, it can be a source of frustration that drains your bank account and leads to costly exterior and even interior damage. When it’s time to replace your roof, you want to know you’re choosing the absolute best roofing contractor for the job. You also want a great value. Here are 10 questions to ask any roofing installation company before you decide. 1. What Type of Work Do You Do? This may sound obvious, but it’s important to ensure that the roofing contractor you choose is an expert in roofing. Your roof is your home’s first and most important line of defense against moisture, mold and mildew. A new roof is not the type of job you want to award to a handyman or general contractor. General knowledge about exterior home improvements is not enough to guarantee that a roofing installation company has the in-depth knowledge to do a quality job of putting a new roof on your home. The roofing contractor you choose should have a long track record of installing new roofs — time after time, job after job. Think of it this way: Your family doctor probably has excellent general knowledge about the cardiovascular system, but you wouldn’t see your general practitioner for a heart attack. For that, you would see a cardiologist — someone with extensive experience in matters related exclusively to the heart. Why should your roof be any different? 2. Where Can I Find Reviews? A reputable roofing contractor will be happy to direct you to places where you can find real reviews from real customers. Experienced, knowledgeable contractors work hard to build their reputation and satisfy homeowners — they want you to see what other homeowners think about their work. Because a roof is something most people buy just once (and maybe twice) during a lifetime, they don’t always know where to turn for honest, trustworthy reviews and advice. Many people start out by asking a friend, relative or neighbor for roofing contractors to contact. This can be a great way to find a reputable roofing company — especially if the person you talk to has recently had their own roof replaced. However, the internet is also a great resource for getting a large number of reviews from homeowners who have used a specific roofing contractor in your area. In fact, studies show that about 81 percent of people research online before buying a product or service. You probably check out what other consumers have to say online before buying a new TV or visiting a restaurant for the first time. Today, you can also search online for reviews on roofing companies. At Nu Look Home Design, we’re proud of our outstanding rating on GuildQuality, an independent, third-party review site for contractors. Our high customer satisfaction rate has led to Nu Look receiving the Guildmaster Award in 2014, 2015 and 2017. On GuildQuality, potential customers can read reviews from real Nu Look customers for gutters, roofing, siding and windows and doors. Would you work with this roofing company again? Did the project stay on budget? Were you asked to pay anything else once the installation got underway? Did the roofing contractor send a construction foreman to the job to be your primary point of contact? Are you happy with your new roof? Has it leaked? Past customers’ experiences are some of the best indications of how your roofing installation will go. If you can’t find the information you need online, ask your roofing contractor if you can call previous customers directly. Many are happy to provide the names and contact details of homeowners who have offered to speak with future customers to share their experience with the roofing contractor. 3. What Factors Determine Your Price? Roof replacement cost is a major factor for just about every homeowner. You want a high-quality job, but you also want to know you’re getting a phenomenal value. As with anything, however, the lowest price is not always the best value. For example, you might pay a little bit less by going with the lowest bidder, but a poor installation or inferior materials could mean replacing your roof again a few years down the road — not to mention dealing with any interior damage due to water or mildew. And when it comes to getting estimates, it’s also a good idea to discard the “conventional wisdom” that says you should always get three estimates. In reality, you should get as many estimates as it takes to feel confident that you’re getting the best roof installation for the most reasonable price. Be wary of bids that seem excessively low or excessively high. Also ask exactly what the roofing company’s price includes. Will the roofing contractor take care of the tear-off of the old roof? Will the crew pick up and clear all debris, including roofing nails, from your property once the installation is complete? What types of materials will be used for your home? Also ask how the roofing contractor handles unforeseen damage and repairs, such as moisture damage or rot they uncover once the tear-off or installation is underway. Is this included in the price, or will you be responsible for coming up with additional funds to cover the cost of fixing hidden damage? These are important questions that can make a significant impact on your project’s budget. Don’t sign a contract until you have clear answers. Everyone’s got to start somewhere, but do you really want your roof to be the guinea pig for a new roofing contractor? Ask your roofing contractor how long they’ve been in business, as well as how long the professionals handling your installation have worked in the industry. It’s an unfortunate reality that some contractors open their doors, perform jobs, and then cease operating after a few years — either due to lawsuits or because they don’t have enough business to sustain themselves. Homeowners who work with these types of contractors have no recourse in the event their roof leaks or they later discovery that the installation was defective. At Nu Look Home Design, we’ve been in business for over 20 years, and we have a well-established track record of delivering the highest quality roof installations in the industry. Our experience is just one of the reasons we’re an Owens Corning™ Platinum Preferred Contractor. It goes without saying that your roofing contractor should be licensed and insured. Ask your roofing contractor to provide verification of all licensing requirements, and to show proof that its workers are insured, including covered by workers’ compensation insurance. The last thing you need to worry about is personal liability related to an injury that takes place on your property. Unfortunately, some roofing contractors offer a lower cost because they perform jobs without the proper licensing and insurance protection. Far from passing on a savings to the homeowner, this merely shifts the cost of liability to the customer. A reputable roofing contractor will have all licensing and insurance requirements in place before they set foot on your property. If your area requires a permit for a roof installation, the roofing company should also take care of this step for you. The roofing company will know which entity to contact and what types of permits to pull to ensure you’re compliant with all local and state laws. 6. What Does Your Contract Look Like? As with any large home improvement job, you should always read through the contract thoroughly. Furthermore, the contract shouldn’t be filled with vague or complicated language. It should clearly spell out the price, dates of performance, warranty information and contingencies for any issues that may arise. If you have any questions at all about your contract, your roofing company should also have a dedicated representative on hand to explain terms and provisions, and to provide clarity in the event you’re unhappy with a portion of the contract. In many cases, you can tell a reputable roofing contractor from a disreputable one by how they handle the contract preparation and execution process. Do they answer the phone when you call? Are they responsive to your questions? Do they make you feel like a bother, or do they treat you like a valued customer and equal partner in your home’s roof installation? If you get red flags at this stage of the process, do you really want that contractor installing a new roof on your home? 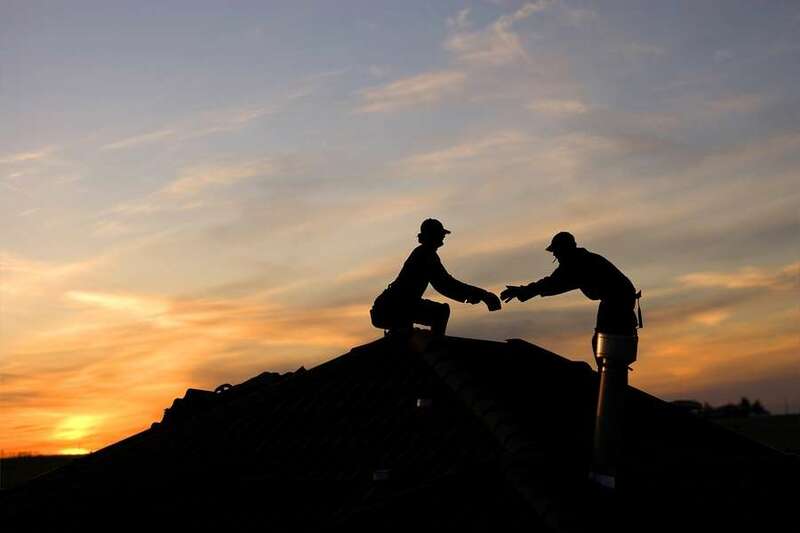 Pay attention to the roofing contractor’s business practices, as this is usually a good indication of how they will conduct themselves for the duration of the job. 7. Who Is Doing the Work? The roofing contractor you hire should be the one that shows up to do the job. Make sure your roofing company is not passing your job off to a subcontractor. Also identify your point of contact for the job. At Nu Look, we appoint a project coordinator that works one-on-one with homeowners from start to finish to answer all questions and provide guidance throughout the duration of the job. We also send a construction management representative, called a project foreman, to every roof installation to be the main point of contact between the homeowner and the installation crew. 8. What Kind of Warranties Do I Get? Ask your roofing contractor about the warranties involved with your job. Warranties generally cover labor as well as materials and workmanship, and you may receive a separate warranty directly from the manufacturer of the shingles and other materials that go into your new roof. This is why it’s important to work with a roofing company that does a high-quality installation, as defects in installation may void a materials warranty offered by the manufacturer. Your roofing contractor should provide you with written copies of all warranties that apply on your roof. Understandably, you may not be familiar with the various options when it comes to roofing materials. However, your roofing contractor should have a deep knowledge of the choices available and what types of shingles and other materials are best suited to your home, location and needs. You should also look for manufacturer designations. Is the roofing contractor a preferred provider for the major suppliers of shingles and roofing materials in the industry? Roofing materials manufacturers only work with roofing companies that are known for delivering the highest quality roofing installations. At Nu Look, we are an Owens Corning™ Platinum Preferred Contractor — an invitation-only designation given to less than 1% of roofing companies in the country. Not only are the jobs we perform covered by our own warranty, they are backed by the Owens Corning™ manufacturer’s guarantee for as long as you own your home. 10. What Happens If I’m Unhappy? If you work with an experienced roofing contractor, chances are your new roof installation will go off without a hitch. However, not every job turns out perfectly the first time. How does the roofing contractor handle it when the homeowner is unhappy with some aspect of the job? At Nu Look Home Design, it’s always our policy to make it right — every job, every time. This is why our customers pay nothing, not even a down payment on materials, until the job is complete and they are completely satisfied with their new roof. Is it time to replace your home’s roof? Call Nu Look Home Design today to talk with one of our roofing experts about your options, including roof replacement cost. Get in touch by calling (800) 279-5300, or sent us an email at info@nlhd.com.